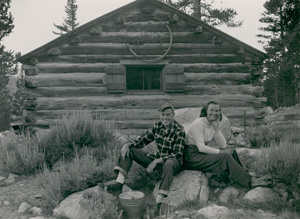 Ardis and Philip Hyde in Front of the McCaulay Homestead Cabin in Tuolumne Meadows, Yosemite National Park, California, Summer 1949 by John Rogers, CSFA Classmate of Philip Hyde's. Ansel Adams helped Ardis and Philip Hyde land this job as summer caretakers of the Sierra Club Parson's Lodge. It was their first cabin in the wilderness but not their last. There were several more until finally eight years later, Ardis and Philip Hyde built their own home in wilderness more remote than Tuolumne Meadows. This became their lifetime "Walden." Besides John Muir, Ralph Waldo Emerson and Henry David Thoreau were Philip Hyde's best loved literary heroes. Henry David Thoreau, though he was graduated at Harvard College in 1837, declined to give up his large ambition of knowledge and action for any narrow craft or profession, aiming at a much more comprehensive calling, the art of living well. Never idle or self-indulgent, he preferred, when he wanted money, earning it by some piece of manual labor agreeable to him, as building a boat or a fence, planting, grafting, surveying or other short work, to any long engagements. With his hardy habits and few wants, his skill in wood-craft, and his powerful arithmetic, he was very competent to live in any part of the world. It would cost him less time to supply his wants than another. Yet, hermit and stoic as he was, he was really fond of sympathy, and threw himself heartily and childlike into the company of young people whom he loved, and whom he delighted to entertain, as he only could, with the varied and endless anecdotes of his experiences by field and river: and he was always ready to lead a huckleberry-party or a search for chestnuts or grapes. He was a speaker and actor of the truth, born such, and was ever running into dramatic situations from this cause. In any circumstances it interested all bystanders to know what part Henry David Thoreau would take, and what he would say; and he did not disappoint expectation, but used an original judgment on each emergency. In 1845 he built himself a small framed house on the shores of Walden Pond, and lived there two years alone, a life of labor and study. This action was quite native and fit for him. No one who knew him would tax him with affectation. He was more unlike his neighbors in his thought than in his action. As soon as he had exhausted the advantages of that solitude, he abandoned it. In 1847, not approving some uses to which the public expenditure was applied, he refused to pay his town tax, and was put in jail. A friend paid the tax for him, and he was released. The like annoyance was threatened the next year. But as his friend paid the tax, notwithstanding his protest, I believe he ceased to resist. No opposition or ridicule had any weight with him. He coldly and fully stated his opinion without affecting to believe that it was the opinion of the company. It was of no consequence if every one present held the opposite opinion. No truer American existed than Henry David Thoreau. But idealist as he was, standing for abolition of slavery, abolition of tariffs, almost abolition of government, it is needless to say he found himself not only unrepresented in actual politics, but almost equally opposed to every class of reformers. If he brought you yesterday a new proposition, he would bring you today another not less revolutionary. A very industrious man, and setting, like all highly organized men, a high value on his time, he seemed the only man of leisure in town, always ready for any excursion that promised well, or for conversation prolonged into late hours. His robust common sense, armed with stout hands, keen perceptions and strong will, cannot yet account for the superiority which shone in his simple and hidden life. I must add the cardinal fact, that there was an excellent wisdom in him, proper to a rare class of men, which showed him the material world as a means and symbol. This discovery, which sometimes yields to poets a certain casual and interrupted light, serving for the ornament of their writing, was in him an unsleeping insight; and whatever faults or obstructions of temperament might cloud it, he was not disobedient to the heavenly vision. Henry David Thoreau dedicated his genius with such entire love to the fields, hills and waters of his native town, that he made them known and interesting to all reading Americans, and to people over the sea. The river on whose banks he was born and died he knew from its springs to its confluence with the Merrimack. He had made summer and winter observations on it for many years, and at every hour of the day and night. Every fact which occurs in the bed, on the banks or in the air over it, the fish, and their spawning and nests, their manners, their food; the shad-flies which fill the air on a certain evening once a year, and which are snapped at by the fish so ravenously that many of these die of repletion; the conical heaps of small stones on the river shallows, the huge nests of small fish; the birds which frequent the stream, heron, duck, sheldrake, loon, osprey; the snake, muskrat, otter, woodchuck and fox, on the banks; the turtle, frog, hyla and cricket, which make the banks vocal—were all known to him. This is wonderful, David. I know so little about Thoreau and his life other than the book Walden. I so enjoy reading your posts. I may have to read something of Emerson. Hi Monte, thank you for reading. I was surprised by the accessibility of this essay by Emerson compared to his other work. Usually his writing is a bit dense and hard to read, but the substance is profound if you can get beyond the form. Dad loved Emerson and quoted him often. Emerson is more outwardly transcendentalist than Thoreau, that is, Emerson writes more often about the spiritual aspects of nature and the world. Thoreau as you probably already know, is more of a pragmatist and revolutionary. Thoreau’s words and actions were timeless — he spoke to the ages. He still influences many even after a century and a half have passed. I was a little surprised too to realize that this was written by Emerson. I haven’t read him in many years, but I don’t remember his writing being this simple and clear. Very interesting and inspiring post. Hi PJ, thank you for the comment. From the limited Emerson I have tried, his writing is not usually this simple and clear. Maybe this is easier to read because it was spoken first as Thoreau’s Eulogy to which Emerson didn’t add too many of his complex and obscure sentences. Still, Emerson’s ideas are worth absorbing if you can glean them from his writing. Thank you for sharing this David. It has given me more insight into the life of Thoreau, many aspects that I didn’t know. His words are so cherished in so many different ways today – I often wonder if there is a Thoreau in our modern times? Hi Mark, thank you for visiting. My parents were a little like Thoreau, but neither of them was as quick-tongued, nor were they as anti-social as Thoreau. They were also more law abiding, but their philosophies of self-reliance, self-determination, frugality, self-effacement, absorption in observing the natural world, dedication to walking and living most days in the outdoors were somewhat similar. Even so, there really is no one like Thoreau. Ahhh, this reminds me I need to do up a post on Walden Pond…..
Hi Derrick, yes, I think that the post would be important, if it is getting trampled. Imagine a traffic jam at Walden Pond. That is just all wrong, Henry David Thoreau loved to walk and would have advised people today to find their own Walden Pond, not worship someone else’s.